Fault polygons are created in the Polygon tab. 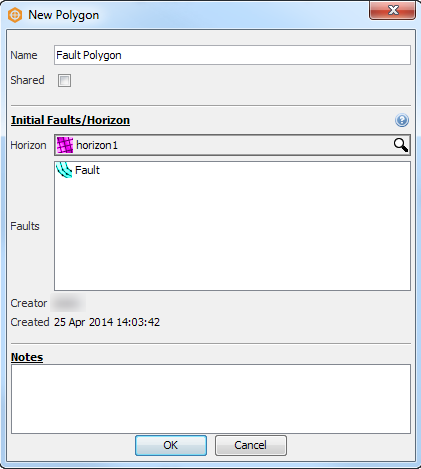 A single fault polygon item contains all of the polygons associated with the faults that penetrate a single horizon. It is also often useful, when picking fault polygons, to see the intersections of faults with the displayed horizon. For more information about fault display settings, see Viewing Faults. In the Control Panel, open the Polygon tab. At the tab header, click the Add icon and click New Fault Polygon. At the New Polygon window, type a Name of the new polygon. 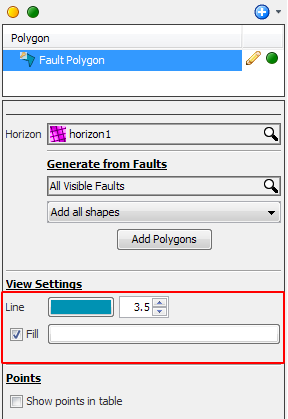 In the Initial Faults/Horizon section, select a Horizon to be associated with the polygon. The Faults box will display all visible faults. You can optionally select one or more faults, for which Insight will automatically create a fault polygon based on the intersection of the fault and horizon. A new fault polygon will be added to the Polygon tree. Under the Generate from Faults section in the Details Panel, either select a particular fault to generate the fault polygon, or generate from All Visible Faults. Replace All Shapes — This will replace all existing shapes with any shapes generated from the fault(s). Replace All Intersecting Shapes — This will replace any existing shapes that intersects with any shapes generated from the faults. Add All Shapes — This will add any shapes generated from the faults to the existing shapes. 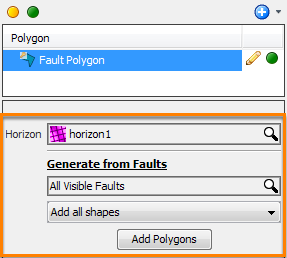 Click Add Polygons to generate the fault polygons based on the intersection of the faults with the associated horizon. 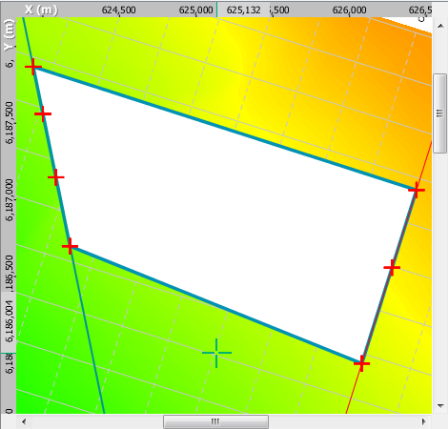 The polygons will be displayed in the Map View to represent the fault surface expression on the horizon. In the View Settings section of the Details Panel, click the colour box and select a line colour for the fault polygon at Line. Type the line thickness for the polygon in the adjacent box. Select the Fill check box to fill the polygon and click the adjacent colour box to select the fill colour. Fault polygons can be edited from the Map or 3D Views by clicking the pencil icon beside the fault polygon in the Polygon tab. Edit the shapes and points of the fault polygons in the same way as any other polygon (see Picking in Map View and Picking in 3D View). Once you have created a new fault polygon product, you can add "shapes" (polygons) to it, such that a single fault polygon product can contain multiple individual fault polygons. In addition to editing the fault polygons directly from the views, you can also add/edit/delete the points of a fault polygon from the Points section in the Details Panel by clicking on the Show points in table check box. This section will only be available once you have picked at least one point. Fault polygons can be imported/exported from Insight in the same way as any other polygons (see Importing a Polygon and Exporting a Polygon). Fault polygons can also be combined with other fault polygons in the same way as any other polygons (see Combining Polygons). Note: This is only necessary if you are importing fault polygons. To add a shape to a fault polygon, click on the pencil icon and begin picking a new shape, or click Add Polygons to insert additional intersecting fault polygons. Once you have created a fault polygon, you can remove that surface area from the associated horizon (see Erasing a Horizon).